1. Pepper your conversation with French. OK, sure. We all like to toss in the odd “entre nous” once in a while or the token “Voilà!” I have no problem with that. But when the French starts to feel forced, it’s sure to grate. I had a writing teacher who had this irritating tic of ending all of his sentences with the phrase “comme ça.” As in: “And so we see that it’s important not to over-use adverbs…comme ça, yes?” Ummmm…comme ça, non. 3. Send out an automatic email reply with a detailed itinerary. I used to work with a woman who, when she went on a business trip, didn’t just say “I’ll be away from my desk until Thursday.” Instead, her automatic replies read something like: “I will be briefing the U.N. Security Council, followed by a one-on-one meeting with the President’s Chief of Staff. Then on to Stockholm to address an audience of 500 about the importance of global warming…” I’m not kidding. 4. Tell people how important you are. I once went on a first – and last – date with a guy who revealed that he’d recently been listed as one of Washington’s 100 most powerful people. (This, right after telling me how much money he made and how often he worked out.) Yuck. Then again, he did end up paying for our meal with a voucher from the Trump Shuttle, so I guess I didn’t register on his Top 100 list either. 5. Do a Series of In-Jokes in Your Holiday Card. For years, we used to get a holiday card from one couple which listed things like this – “Tagliatelle with G.! Singapore in Spring!” – which, of course, no one could possibly understand or relate to unless they had, in fact, been eating tagliatelle with G. or been in Singapore in Spring. Any other pompous traits I’ve failed to mention? 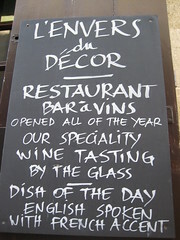 Image: English Spoken with French Accent by Amelieavian via Flickr under a Creative Commons License. Another one that annoys me supremely, but that I have caught myself doing, from time to time… the celeb’ name dropping. Quite funny when it backfires and the party you are trying to impress doesn’t even register!